My passion for playwriting has led me to write tragicomedies, melodramas, post-dramatic pieces, metaphysical cabarets, puppet theatre and opera librettos, among others. As for themes, I am interested in those that have always affected people and the way in which these are incarnated in our times, with special attention to human fragility, which is present in all my works. I believe that theatre has the power to heal spectators, as good theatre is none other than theatre capable of transforming pain into humour, beauty, mystery, awareness and radiant closeness to others. Playwright, actor and director. During the years that the Companyia Hungaresa de Teatre was alive, he was its administrator, and he shared the functions of artistic director with Lola López and Lluïsa Cunillé, the other founders of the company. As a playwright, he has premiered over 20 plays and has directed around fifteen shows. Among his plays for theatre, highlights include Hilvanando cielos (2013), El alma se serena (with Lluïsa Cunillé, 2010), L’última paraula (2009), El mal de Holanda (2008), Tiempo luego existo (2007), Ciudadano Sade (2007), Arbusht (2006), Solo ante el delirio (2005), Exilio (2004), El páramo donde fue herido de muerte Jorge Manrique (2003), El hipnotizador (2002), Húngaros (with Lluïsa Cunillé, 2002), Ultramarinos (1999), Cocodrilo (1998), Valencia (1997), Umbral (1996) and Viajeras (with Lluïsa Cunillé, 1996). 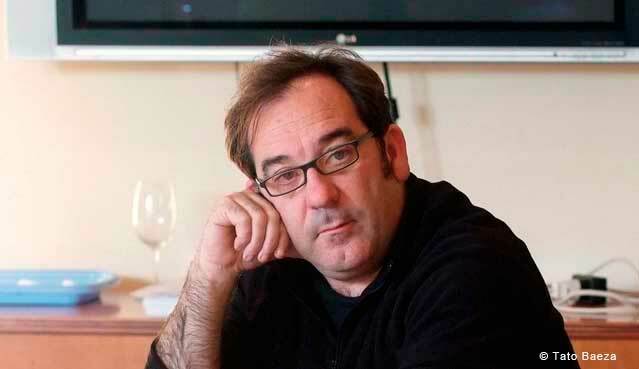 He has also received various prizes, prominently including the Marqués de Bradomín 1996 and the Enrique Llovet 1997 for Umbral, the Max Aub 1998 of the Theatres of the Generalitat for L’altre (translation into Valencian of Umbral), the Critics’ Prize of Valencia 1998 for Cocodrilo, the SGAE Prize for Theatre 1998 for Mirador and the Ciutat de Barcelona Prize 1999 for the best show and the Serra d’Or Prize for the best show for Ultramarins. He also regularly teaches courses in dramaturgy and playwriting. The action in Hilvanando cielos takes place one hot summer’s night in the unkempt garden of an old actor who has worked his whole life with the National Classical Theatre Company. After the announcement of an irreversible threat to the future of humanity, his house is the place where the old actor takes shelter, joined by his son – himself an actor in a hit television series – his son’s wife – an architect who is drawing up the plans of a building that will never see construction – and Cordelia – their mysterious teenage daughter. That night the family lose their dogs in the most traumatic way, and also receive a visit from a disturbing local woman who will reveal something that will affect and definitively destabilise the entire family. A great theatre diva and a well-known theatre critic fight in a duel of titans, a duel of dialectic virtuosity full of surprises. The show portrays the emotional awkwardness of a couple who meet once more after splitting up. A biting text, with an acidic and intelligent humour, full of double-entendres and dual intentions, paints a couple that has not got over the break-up. The diva has not forgotten the destructive criticism that her husband made of a play, Medea, while he, utterly dejected, is abandoning the world of theatre for that of bullfighting. Dutch Elm Disease is a condition affecting elms all over the world. It appeared for the first time in Europe in the Low Countries (Belgium and the Netherlands) in 1922, transmitted by the Chinese arriving in the old continent to work on building the railways, by transporting cases made from wood infected by the fungus. Elms, according to the experts, are sentenced to die and have no future as trees; however, as bushes they may perhaps survive. All the action in El mal de Holanda takes place in the reception of a Ford car dealership in our times. Beatriz, a biologist who is studying Dutch Elm Disease, turns up accompanied by her brother, a chimerical unemployed lawyer, at the dealership where she bought her car, as it has suffered a very serious malfunction. What Beatriz hopes is that Ángel, the dealership’s salesman and at the same time a local poet, will fulfil the promise he made to her on the highest hill in the region: that if the car suffered any malfunction before it reached 40,000 km, the distance of the earth’s perimeter, that Beatriz would not have to pay for the cost of repairing it. The characters who meet up at this car dealership will become unwitting spokespersons in an apocalypse.